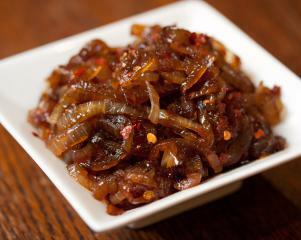 Chilli jam makes a great base for stir fries and is an excellent way to preserve chilies. Makes four tablespoons, enough for two stir fries. Chop the onion, chilli and garlic. Fry the onion in a pan with the oil on a medium heat for about two minutes until it starts to brown. Add the sugar and a little more oil as needed and continue cooking for a minute until the sugar is dissolved and the onion is glossy. Then add the garlic, ginger and chilli and cook for a minute. The chilli jam can then be blended in the food processor or spice grinder until smooth or left as is.